Last week, I posted an article on brewing with tubers. I used my sweet potato ESB recipe as an example. Here is that recipe formulated to be brewed with a simple 3-gallon (11-L) all-grain brewing setup. With this 3.0-gallon (11-L) all-grain brewing setup, you can brew all-grain beers in your kitchen and have everything fit on your countertop. There are also some fringe benefits to brewing at this scale — you don’t need to make a yeast starter for this beer, the wet T-shirt method works well for cooling fermenters at this scale, and your heating and cooling times can be very quick. (See our post on small batch brewing for more.) This is a great way for apartment dwellers to brew all-grain batches. The only downside is that you yield 3.0 gallons (11 L) of beer rather than 5.0 gallons (19 L). There is also a 5.0-gallon all-grain version of this recipe. For other 3.0-gallon all-grain recipes, see the links at the bottom of this post. This is an ESB (Extra Special Bitter) with an interesting orange color due to using sweet potatoes as an adjunct. 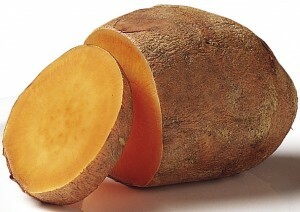 The sweet potatoes do not add any flavor or aroma, just the color (and some fermentable sugars when they are mashed). Peel sweet potatoes and cut them into 1-inch cubes. Add 1.0 gallon to your brewpot and boil sweet potatoes until tender (about 20 minutes). Whip sweet potatoes, still in your brewpot, and don’t pour off any of the liquid first. You can use a potato masher or a fork. Add cool water to make 2.0 gallons. Heat this brewing liquor (with sweet potatoes in it) to 164 °F and stir in the crushed malts to mash in (in your brewpot). Mash at 153 °F for 60 minutes, stirring every 10 minutes. Add heat as needed to maintain mash temperature. Perform an iodine test to ensure that the starches in the sweet potato have converted. Heat the mash to mash out at 168 °F. Transfer mash to 3-gallon beverage cooler lined with a stepping bag. Recirculate wort until clear, then run off. Sparge steadily over 60 minutes to collect about 3.5 gallons of wort. You will need about 1.5 gallons of sparge water. Vigorously boil wort for 60 minutes, to yield post-boil volume around 3.15 gallons. (Add boiling water, if necessary, to keep boil volume from dropping below 3.15 gallons.) Add hops, Irish moss and yeast nutrient at times indicated. Chill wort, then rack to fermenter. Your yield should be 3.0 gallons. Aerate wort thoroughly and pitch yeast. Ferment at 68 °F. After fermentation stops, let beer settle for 2–3 days. Carbonate to 2.5 volumes of CO2. As is, the recipe is a hybrid of English malts and American hops and yeast. To brew a more English version of this ESB, replace the Centennial hops with the same weight of Fuggles hops. Replace both the Cascade and Amarillo hops with the same amount (by weight) of East Kent Goldings hops. Substitute either a high-alpha English hop (such as Challenger) or a neutral high-alpha hop (such as German Magnum) for the Simcoe and adjust it’s amount so the overall IBUs are 38. Ferment with your favorite English ale yeast. Peel sweet potatoes and cut them into 2.5-cm cubes. Add 3.8 L to your brewpot and boil sweet potatoes until tender (about 20 minutes). Whip sweet potatoes, still in your brewpot, and don’t pour off any of the liquid first. You can use a potato masher or a fork. Add cool water to make 7.6 L. Heat this brewing liquor (with sweet potatoes in it) to 164 °F and stir in the crushed malts to mash in (in your brewpot). Mash at 153 °F for 60 minutes, stirring every 10 minutes. Add heat as needed to maintain mash temperature. Perform an iodine test to ensure that the starches in the sweet potato have converted. Heat the mash to mash out at 168 °F. Transfer mash to 11-L beverage cooler lined with a stepping bag. Recirculate wort until clear, then run off. Sparge steadily over 60 minutes to collect about 13 L of wort. You will need about 5.5 L of sparge water. Vigorously boil wort for 60 minutes, to yield post-boil volume around 12 L. (Add boiling water, if necessary, to keep boil volume from dropping below 12 L.) Add hops, Irish moss and yeast nutrient at times indicated. Chill wort, then rack to fermenter. Your yield should be 11 L. Aerate wort thoroughly and pitch yeast. Ferment at 20 °C. After fermentation stops, let beer settle for 2–3 days, then rack directly to keg or bottling bucket. Carbonate to 2.5 volumes of CO2. So, how does this sweet potato beer taste? Do you like it? I am thinking of entering this beer into a Sweet Potato festival.